Sign into Pawbe to contact members and receive email notifications of new listings in your area. Vizsla is easily recognized by his sleek golden-rust coat. They can stand between 21 to 24 inches at the shoulder and are the picture of a lean, light-footed hunter’s companion. The long, silky ears frame a facial expression that is sensitive and loving around the house and intense when at work. As a hunter expected to work closely with humans, Vizslas form a tight bond with their owners and hate to be left alone. 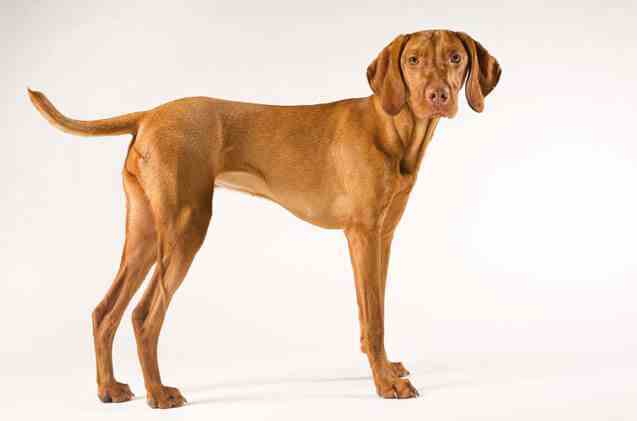 Vizslas have a short, sleek coat with no undercoat, so they don’t require complicated grooming. They do shed, and occasional brushing with a rubber grooming brush is helpful. When they get especially dirty (or when they roll in something smelly), they will need a bath with lukewarm water, a good-quality dog soap, and thorough rinsing. It is important to keep the toenails short, either with a clipper or with a grinding tool. Ears should be checked frequently for dirt, wax build-up, or signs of irritation. Regular use of a mild ear-cleaning product will help prevent problems. To keep teeth and gums healthy, regular cleaning is recommended; use a product formulated for dogs (not human toothpaste). Vizslas are generally a healthy breed. A typical lifespan is about 12 to 15 years. As in all breeds—and in mixed breeds—cancers are a concern. Responsible breeders screen their stock for health conditions such as such as seasonal allergies; eye disorders, including melanosis or entropion; hip dysplasia; epilepsy; and ear infections. Careful breeders do their homework ahead of time for the best odds of producing sound, healthy pups. Vizslas were bred to be active hunting dogs, and they need both physical and mental exercise. Individual dogs’ needs vary, but, in general, owners should plan on a minimum of 30 minutes of active exercise daily—and some dogs will need more than that. In addition to leash walks and games of fetch, most Vizslas need opportunities to run hard off-leash on a regular basis. Mental exercise is as important as physical activity, so training should be part of their routine. Vizslas can be excellent running or jogging companions, with the caveat that young dogs should not run long distances until they reach maturity at about 18 to 24 months. Older Vizslas typically remain active and playful. Vizslas need consistent, positive training, starting in puppyhood. They are highly intelligent, curious, and sometimes manipulative, so owners need to establish solid communication and teach good behavior. Untrained Vizslas are hard to live with. They can find many creative ways get into trouble if they don’t have a “job.” Fortunately, they typically love training and thrive on the attention they receive. This is a sensitive breed, so early and ongoing socialization is important to make sure the dog has the confidence to enjoy various activities. With good socialization and consistent training, there are countless ways to have fun with these versatile dogs, including field trials, hunting tests, conformation, obedience, rally, agility, dock diving, barn hunts, lure coursing, scent work, and tracking.